Coming soon to the iPad, NanoStudio is likely the best iPhone music editing application you’ll see. Short of putting together a full studio for mixing, synthesis, and sequencing in a dedicated studio, NanoStudio has just about everything you can think of for music file creation, editing, synthesizing, and mastering. With great tools for sampling, composing, reverb, and more, there’s a lot more to this app than anyone would expect from something running on the tiny iPhone. Of course, studio-quality is probably not going to happen with an iPhone and the app uses low-latency audio and while it’s in CD quality, it isn’t studio-perfect by any means. But for something from your smart phone or even a full-fledged PC or Mac, it’s very good stuff. If you’re familiar with the basics of audio mixing and editing, then you’ll be right at home with NanoStudio. It’s sampling is as good as can be expected from the iPhone’s mic (if you’re using that live) and wave editing tools and multiple undo/redo make it a dream to work with. Three output buses add effects and filters while the real-time sequencer allows you to use trigger pads or keys to create added sounds and beats. The features list is too long to give here, but includes some things you will only find on quality audio hardware or professional gadgetry. 128 global and 24 project-specific presets, 16 trigger pads, 4x Eden synths, a 6-track sequencer, 100 pattern support, and more all make NanoStudio into a real blockbuster of an audio app. It’s all on your iPhone too, which is very tidy. 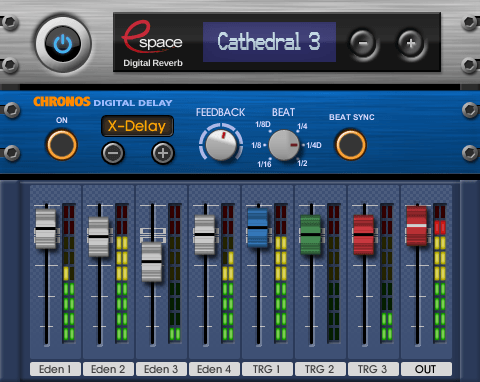 If you try this app, be prepared to spend hours mixing and fiddling as you’ll find it to be more than you thought any low-cost audio software could be.